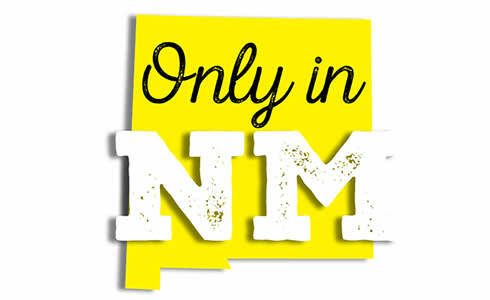 Please share your anecdotes and thoughts with us via e-mail at onlyinnm@nmmagazine.com, or use Facebook, as these members of the NM Magazine community did. The smell of creosote after a rain ... hypnotic sunsets ... soaking in hot springs while watching the full moon graze its way up from behind the mountains ... and of course, green chile on everything! People are polite in NM, and not in a hurry. They take time to connect on a personal level every day. It’s a different way of being from the rest of the country, due to the influence of the beautiful landscape and the heritage of the people. City limits are more than a concept. When I drive home I can actually see where my city ends and the desert opens up for hundreds of miles. I never grow tired of it. Where else can you see double rainbows that start and end over a beautiful lake, clouds in the morning that you can nearly touch hanging over that same lake? 360-degree views of the mountains, herds of elk in the meadow across the highway, a doe resting in the grass at the side of the cabin, and beautiful hummingbirds? Only in New Mexico—Eagle Nest, to be exact. Only in NM could I, as a girl, walk along the irrigation ditches after eating a hearty meal in La Mesa with my family at Aunt Shirley and Uncle Tex’s house. Dreaming and scheming about life ... it healed me every time! Only in New Mexico can I ride through the drive-through at Dandy Burger in Española on horseback, and find a hitching post for my horse in front of Wal-Mart. Only in NM is the sun shining in front of your house while it rains in the backyard.